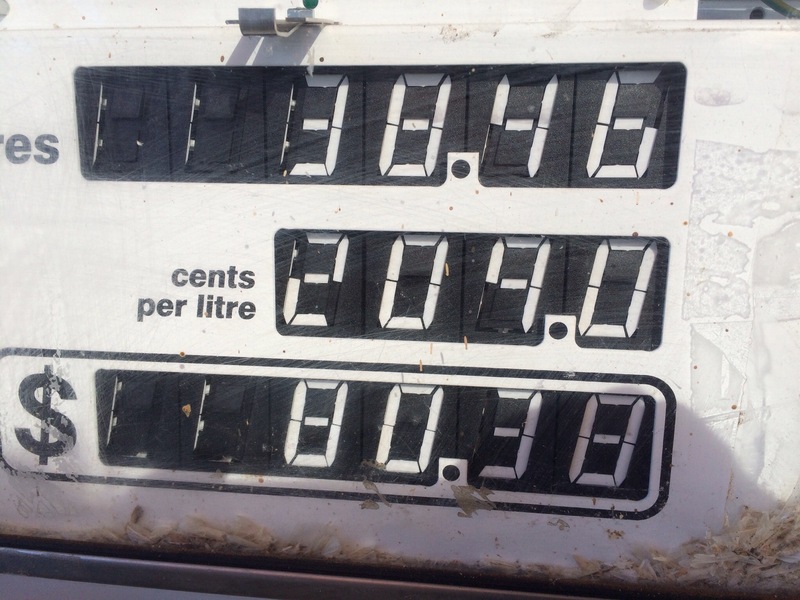 We leave Kings Canyon and fill up the car. It looks like the servo here will get the record for the most expensive fuel for our trip. 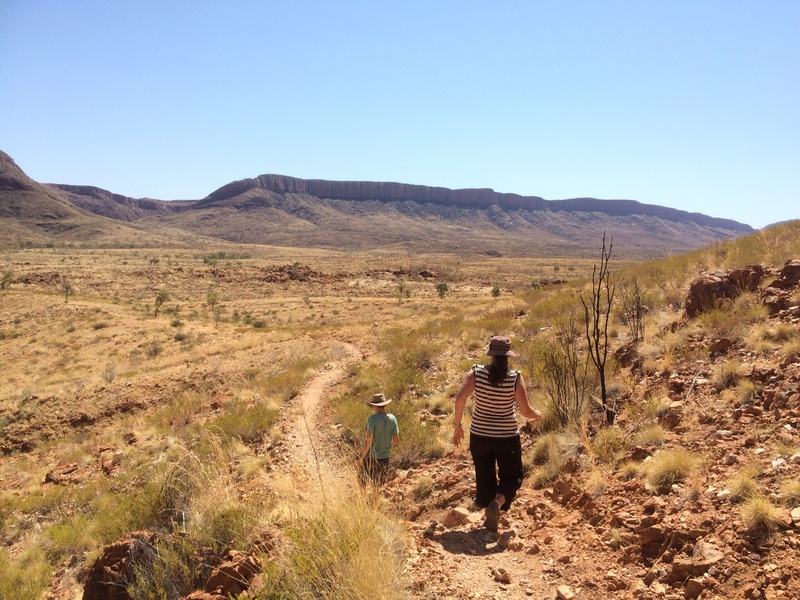 We’re going to Alice via the West Macdonnell ranges. It’s aboriginal land so we need to get a permit before we drive through. We’re learning the definition of a ‘bad road’ is a subjective thing. 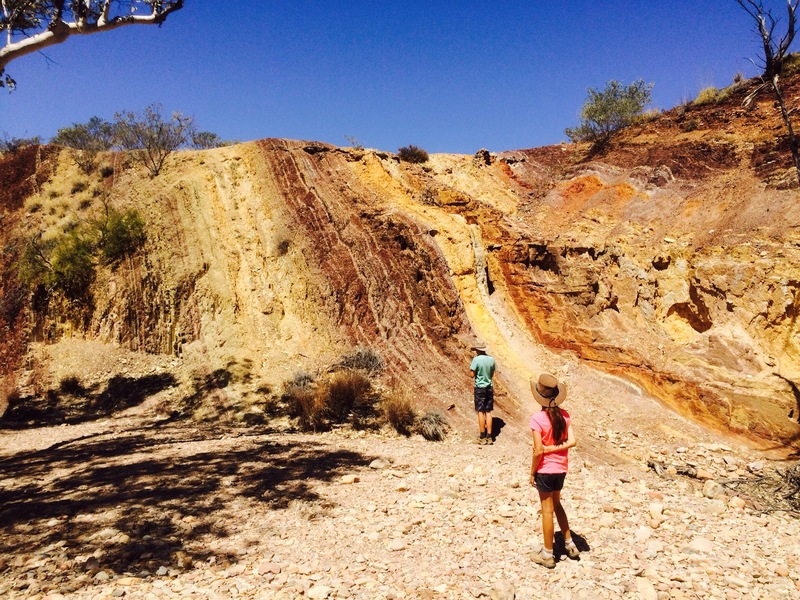 When we took the short cut from Ceduna we were told the road was really good but there were some parts of it that were really rough. With this road we kept hearing that it’s in a terrible condition. But when we drove it we didn’t think it was that bad. 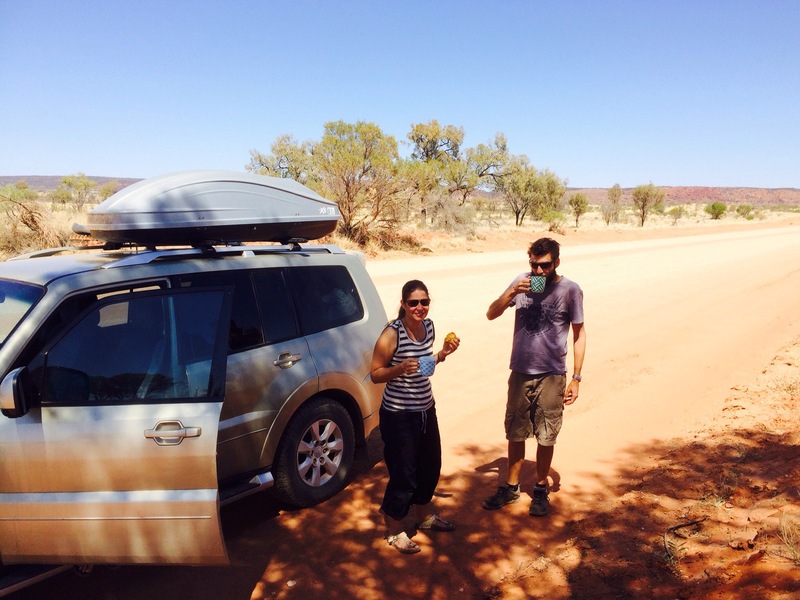 Though the corrugations do become a bit mind numbing so here’s us taking a break by the side of the road. After all we’ve seen I think we had low expectations for the West Macs (mixing it up with some local lingo there) but in the end we thought they were stunning. 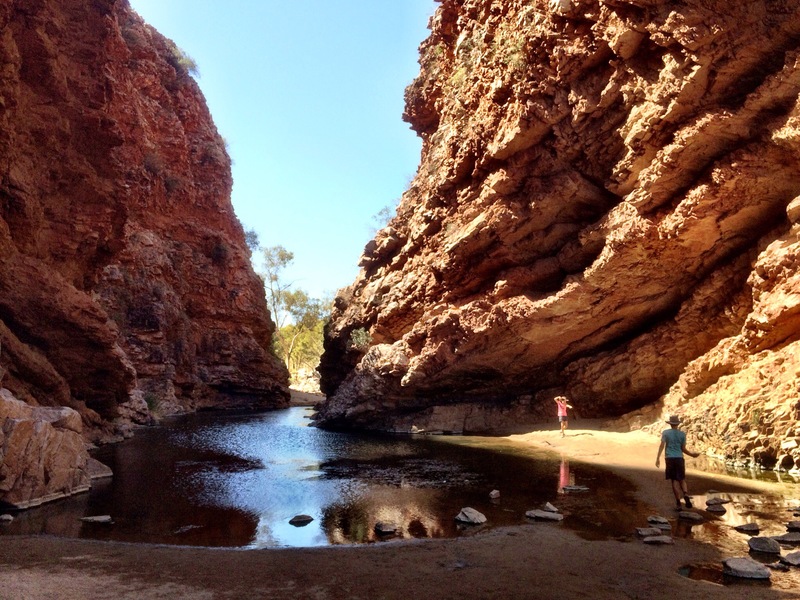 We went to Redbank Gorge. The prospect of swimming through narrow gorges is just too irresistible for me, even if the water is ice-cold. It was particularly painful because you have to climb up out of one pool and then psyche yourself up to get back into the next one. It’s so cold it’s exhausting to swim in. Kirsty the wimp opts out of this adventure. We also go to Gosse Bluff which is a meteorite crater. While there Noah gets a big nose bleed. 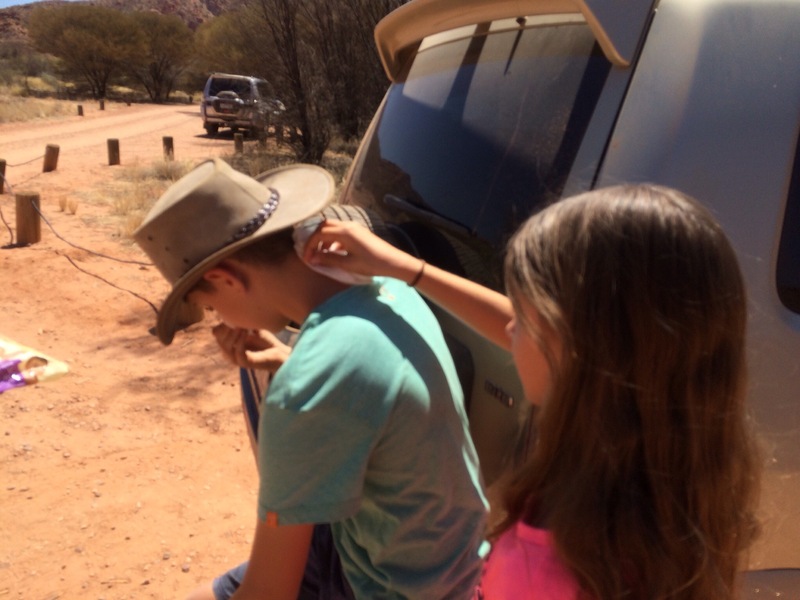 This is sisterly first aid – trying to keep Noah’s neck cool. 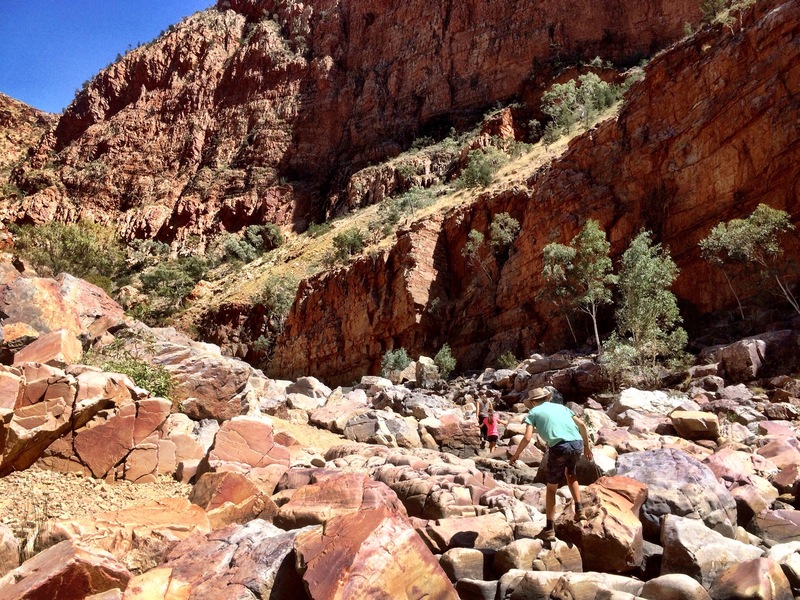 We end up pitching camp at Ormiston Gorge. 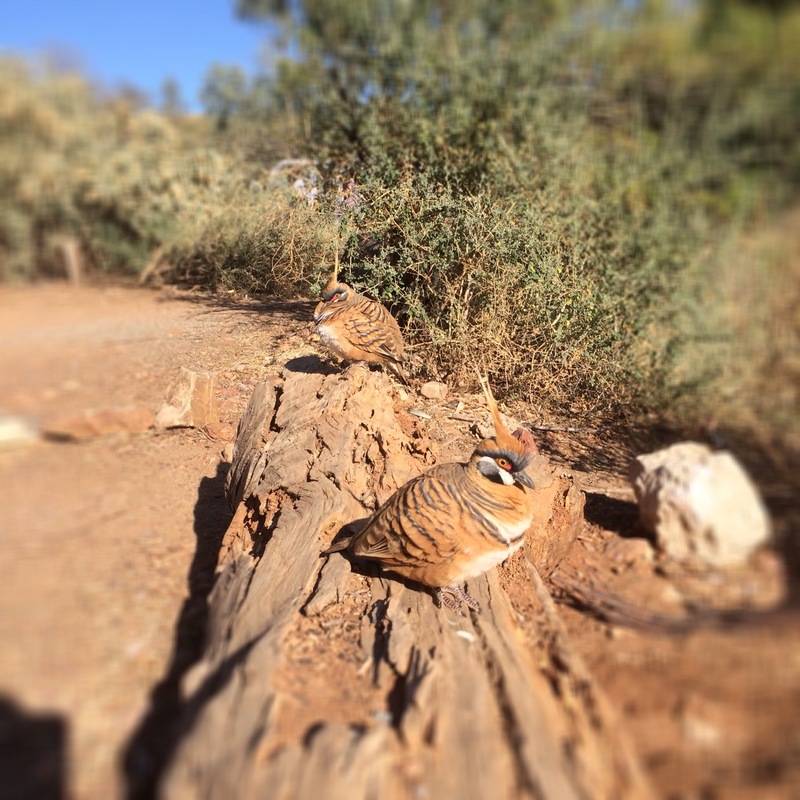 We discover the spinifex pigeons are very friendly and like to get close. 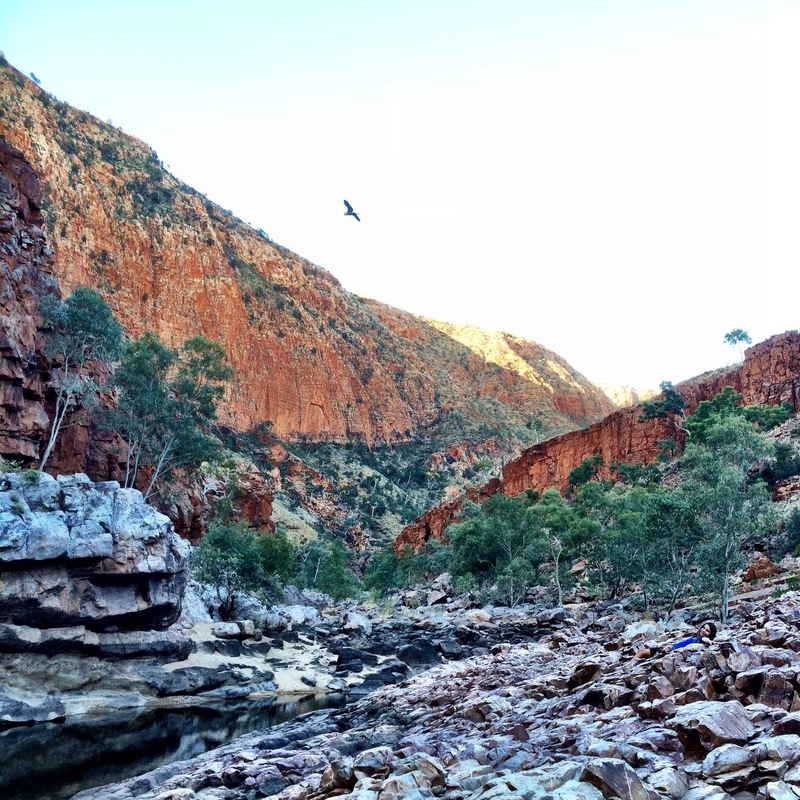 Late in the arvo Amelia and I go for an explore up the gorge. 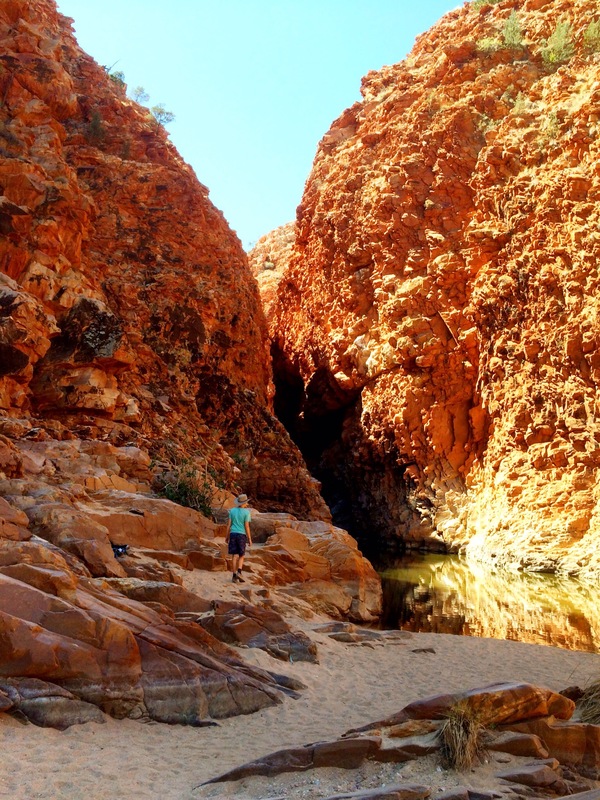 On our final day is the West Macdonnells we do the 7km Pound Walk at Ormiston gorge. The whole time we’re walking Noah is excited to talk about the prospect of a future overnight hike somewhere. It’s nice to think that it might be a future adventure for us. 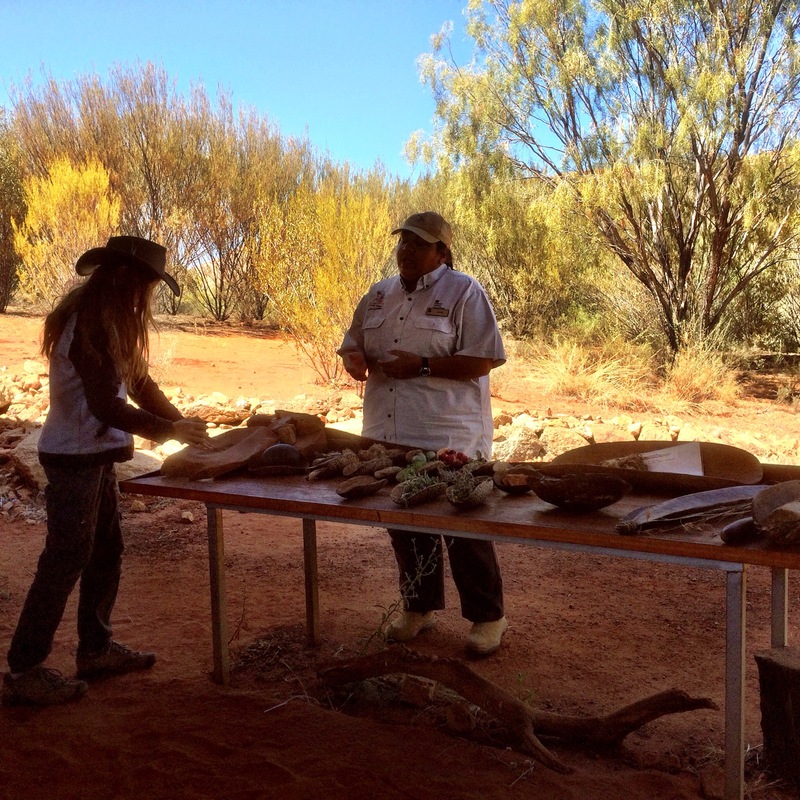 Before we leave the West Macdonells we check out the old aboriginal ochre quarry. 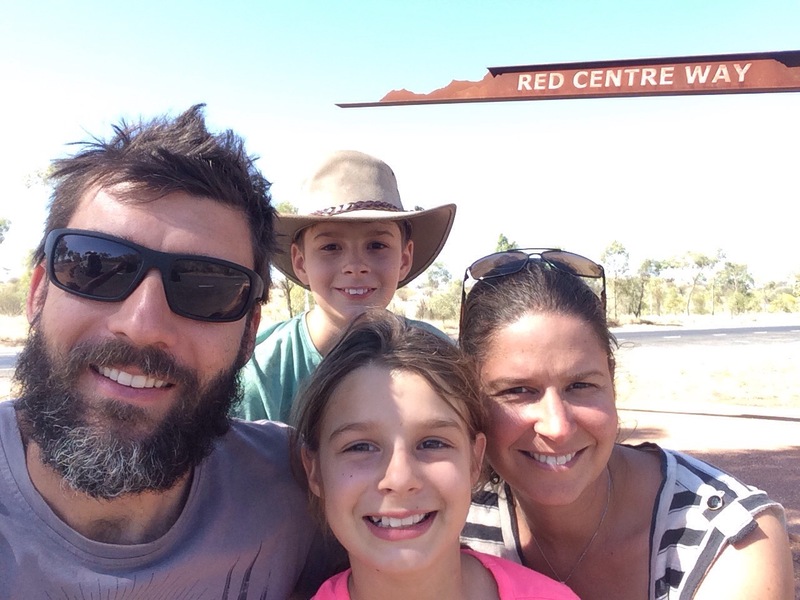 We arrive at Alice and we get this family photo at the maker which indicates you’ve travelled the ‘Red Centre Way’. 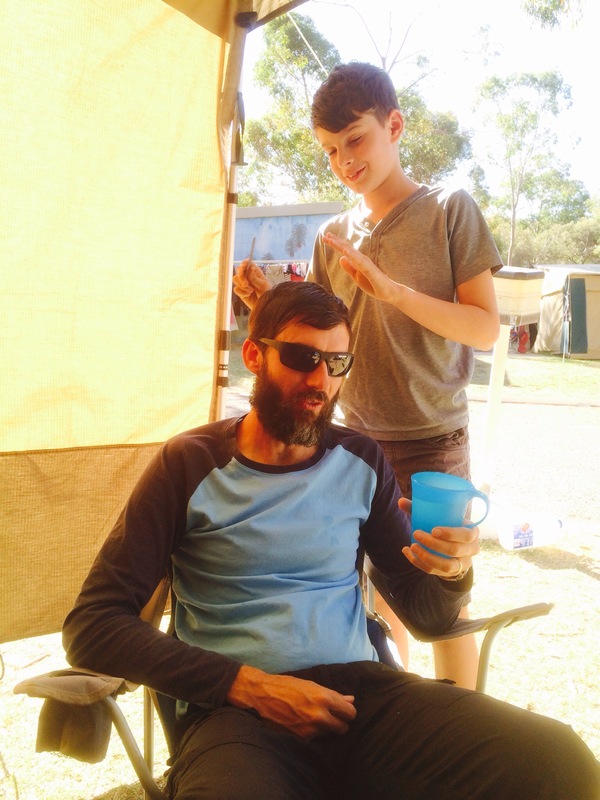 And then we get to ‘G’day Mate’ Caravan Park. 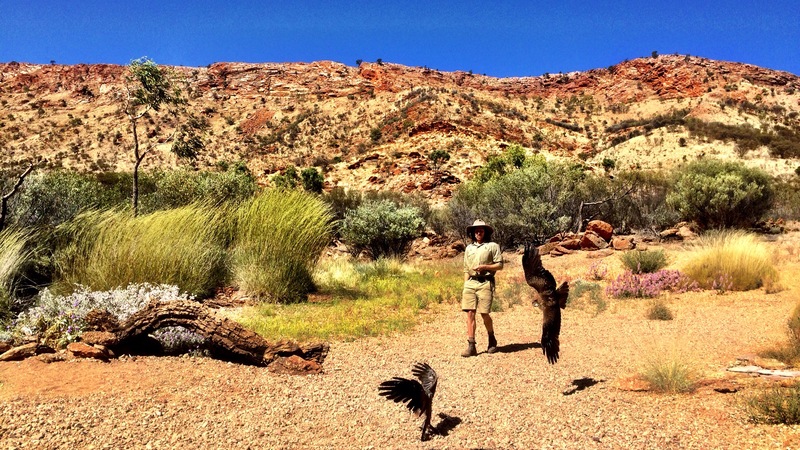 We have 2 full days in Alice Springs. It’s nice to not be in a rush in the morning so when we finally get moving we head to the mall in Alice and look at the shops. There’s lots of Aboriginal Art galleries here. It was good to chat to a women running a gallery who explained all the differences in the styles. 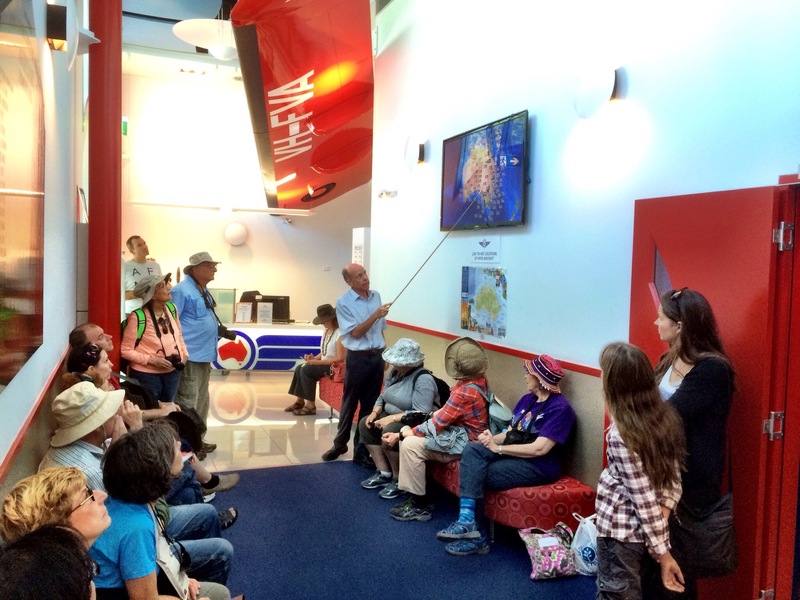 We also go to the Royal Flying Doctors Service (RFDS) museum. While we were wandering through the RFDS gift shop Noah is accused of shoplifting! A fellow customer saw Noah put something in his pocket and he is asked to take it out. Noah takes out a pack of playing cards he bought earlier in the day and the customer has a check to see if it’s been swiped from this gift shop. We didn’t see it happen but Noah came up to us afterwards to tell us all about it. He said, ‘I felt guilty even though I didn’t do anything’ but overall I think he was a bit excited to be caught up in a ‘crime incident’. On the way home we stop into a book exchange to try and get some new books for the kids to read. The kids get something each. So in the arvo all 4 of us are just sitting around reading. Nice. For our final day in Alice Springs our first stop is the old Government residency building. Twice a week it’s turned into a Bakery. And what a bakery it is! This is one of those tough decisions we have to make while on holidays. Will it be an Almond Scroll or a Black Forest Donut? 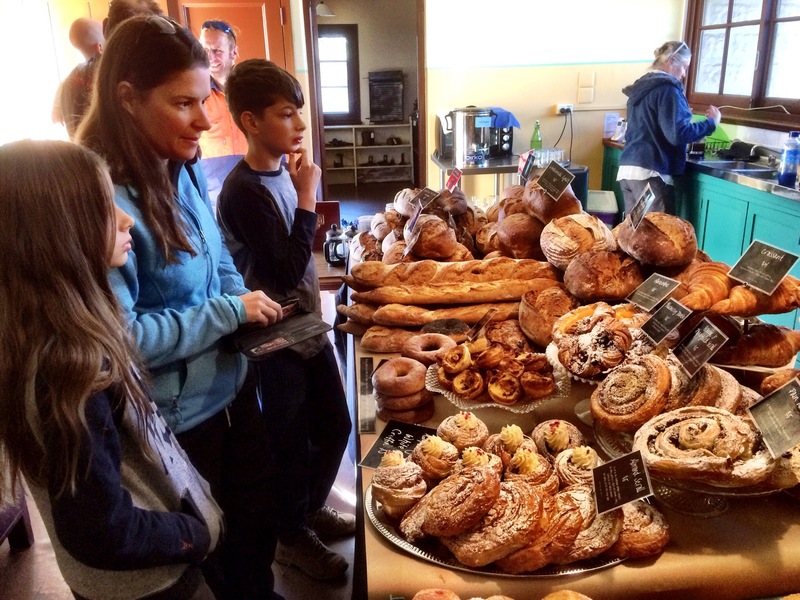 With our pastries in hand we go to the Desert Nature Park. This place is really good. Lots of animals to see and various shows you can get along to. We get to the bird show. And we also get to the presentation about bush tucker. Amelia gets to grind up a nut which the aboriginals would use for their flour. 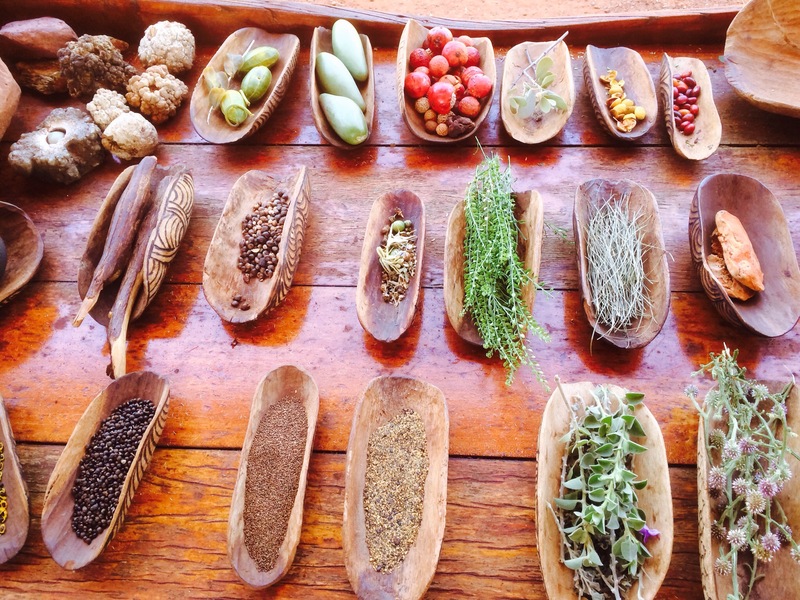 We were told about an aboriginal remedy for warts and various skin conditions. 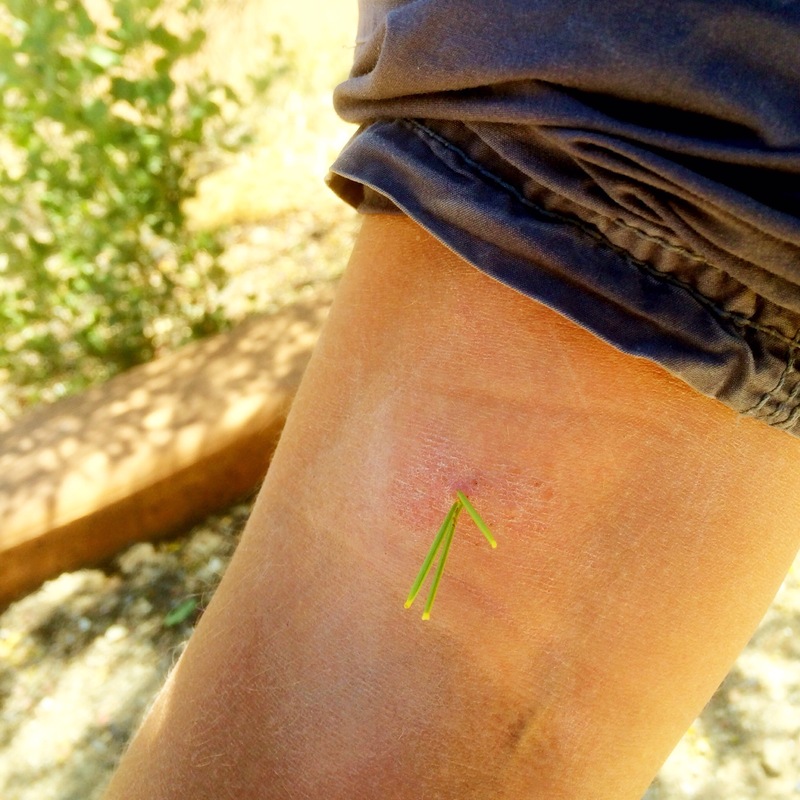 Leaves from a plant are stuck into the skin. Amelia is willing to be our pin cushion guinea pig. We also got up close to a big red. 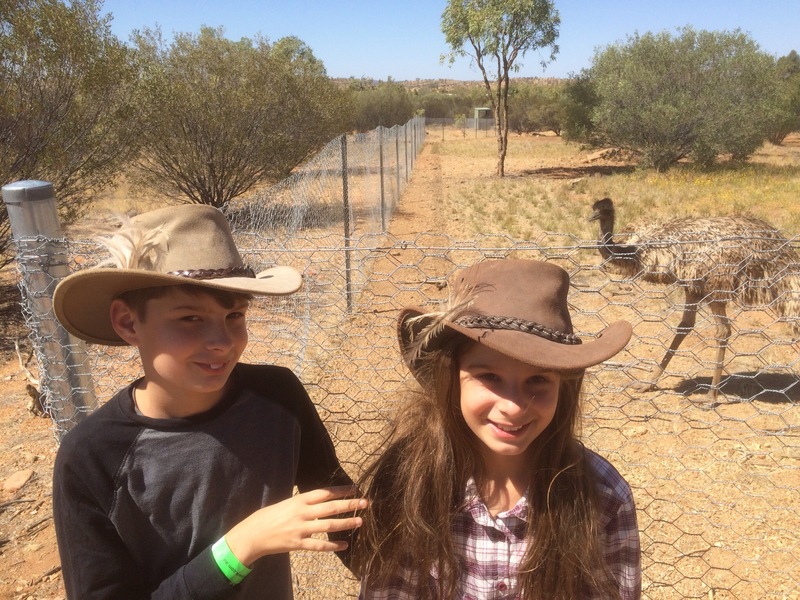 And the kids try out the latest fashion of emu feathers. 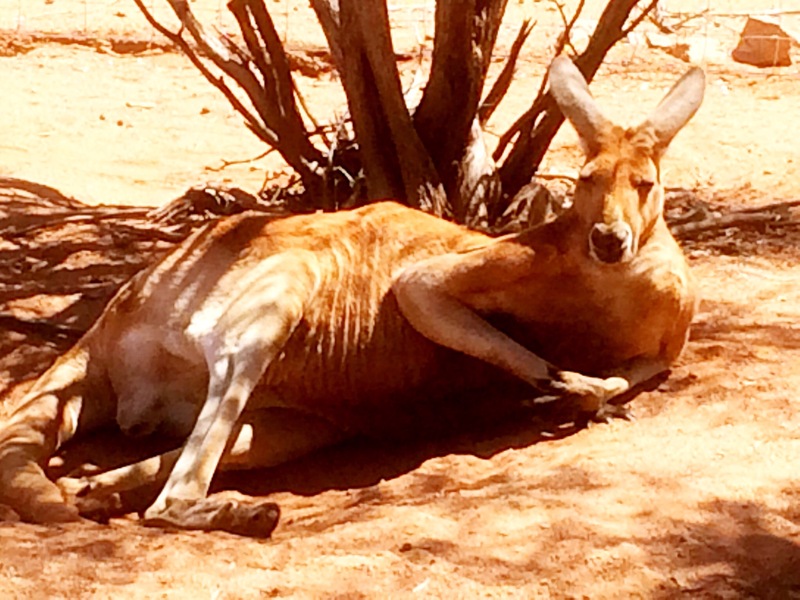 Back at camp in the arvo we’re just hanging out. For entertainment Noah decides he wants to style my hair and beard. 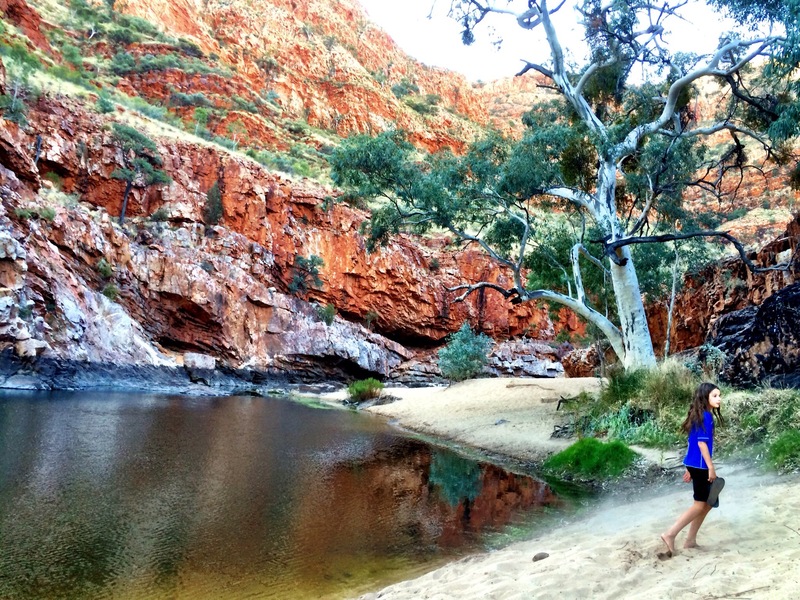 I remember that Redbank gorge swim and how cold it was as well. It was so cold and the panic that nearly set in on me as I struggled to get up onto the rock ledge. I was so glad to get up and out to catch my breath. Great trip guys. Yes! What cold water it is. The kids eyes were very wide as they were paddling along. I don’t think they knew what had hit them. Amelia grabbed a couple of logs to try to keep out of the water as much as possible. Good to see a cuppa had, without being stuck!